I’ve gravitated more toward a whole food-based diet over the past couple years, but if you knew me back in the day, I was a diehard "plant meat & potatoes" kinda vegan. I ate lots of vegan meat substitutes, both storebought and homemade. I still love that stuff, but in my efforts to work more beans and veggies into my diet, plant meats have taken a bit of a backseat. That said, I LOVE the stuff. And a few nights a week, I like to live it up with homemade seitan meats or delicious vegan meaty dishes from my favorite restaurant, Imagine Vegan Cafe. Of course, making the meats at home is best (and the healthiest way). And there’s a new cookbook — Plant-Based Meats: Hearty, High-Protein Recipes for Vegans, Flexitarians, and Curious Carnivores — that covers the art of homemade plant-based sausages, meatballs, ribs, jerky, burgers, roasts, and more. This new book by Robin Asbell features both seitan-based, homemade meats, as well as more whole foods-based options (like meats made from walnuts, tofu, or mushrooms). There’s a chapter for just about every type of meat you can imagine. The Basic Meats chapter gives instructions for how to make a few plant meats, such as beef seitan, vegan chicken breasts, and vegan ham, that are used in many recipes. I chose to try a few recipes, including this one for Moroccan Merguez Tagine. This traditional tagine is made with sweet potatoes, chickpeas, spinach, diced tomatoes, and a fragrant bouquet of spices, like cinnamon and coriander. But the star ingredient is Moroccan Merguez, a seitan sausage spiced with harissa and flecked with bits of white potato (to mimic the look of fat). Wouldn’t this be beautiful on a charcuterie board with vegan cheese and crackers?! I have some leftover sausages that I’ll probably use for just that! Loved the tagine! The spice combo was amazing, and the chewy, meaty seitan sausage really stepped it up. 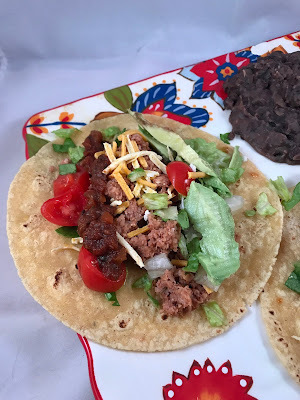 I also tried the more whole foods-y Walnut-Cauliflower Ground Beef for tacos! This ground beef sub is made with minced walnuts and riced cauliflower and seasoned with oregano, chipotle powder, and smoked salt. I can’t remember the last time I had a better taco than this. Seriously. There are so many more recipes I want to try — Cantonese Honey-Glazed Lemon Chicken (with vegan honee and seitan chicken breasts), Jamaican Curried Greens with Jerk Chicken, Smoky King Trumpet Mushroom Bacon (on a BLT, obvi), Pomegranate Glazed Wings (on bamboo party forks to mimic bones!! ), and the Savory Miso Roast with Gravy (a seitan roast for the holidays). If you love vegan meats, you’ve got to check this book out. It’s definitely the most comprehensive guide to vegan meats I’ve seen to date!